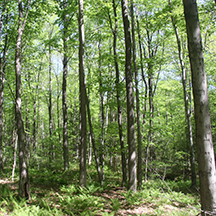 Forests are the natural land cover in the vast majority of Massachusetts. If you stop mowing your lawn, within a few years you will have a forest. It is estimated that historically between 70%-90% of Massachusetts was once forested. Today Massachusetts is 62% forested, making forests the most common type of habitat in Massachusetts, and therefore critical to conserving our native wildlife populations. Most of this forested habitat (70%) is privately held, owned by families and individuals. Communities and conservation organizations are also important landowners. Of course, not all of our forests have the same types of trees. Tree species grow on sites they are adapted to, such as warm, dry sites or cool sites with deep soils. Common Massachusetts forest types include: spruce-fir (found in the Berkshires), pitch pine-scrub oak (found mostly on the cape), northern hardwoods (most common in the hilltowns of the Berkshires), central hardwoods-pine, and transitional hardwoods. Forests not only differ by species, but also age. We tend to think of forests as only being those areas with large trees; however, forests also include areas with seedlings and saplings. In fact, because most of the forests in Massachusetts have older, larger trees, some of the most lacking wildlife habitats are young forests with seedlings and saplings. Most wildlife needs forest of some kind for at least part of its life. Even many aquatic species depend on forests to keep the water cool and create habitats such as pools. Understanding the changes that are likely to happen to our various kinds of forests because of climate change will help us better understand the implications to wildlife species. Implementing adaptation strategies for our forests is a very effective way to assist many wildlife species.